Click on an image to view a contributor's biography. Christopher Berg is a writer, artist, and part-time web developer living in Berkeley, California. His interests include archaeology, astronomy, classical music, and the art and science of maze puzzles. Before becoming a writer he was a management consultant for many years, specializing in corporate development and business unit strategy. Prior to that he once rode a motorcycle across the United States, accompanied by little more than a jar of peanut butter and a bag of carrots. Christopher has been creating maze puzzles since fifth grade, when he first began drawing mazes of various formless objects, such as amoebas. Since then his maze puzzle art has been published by HarperCollins, reproduced by the British Museum, serialized in Games magazine, featured on CBS and Fox television, and used in ads for Ben & Jerry's ice cream. 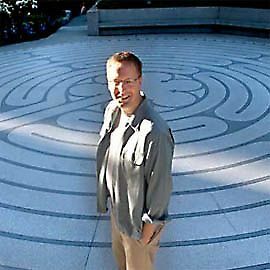 He has spoken about mazes, labyrinths, and ancient history on talk radio nationwide, including the Art Bell show and NPR affiliates. His maze art can be found at www.amazeingart.com. His favorite kanji is 迷 (メイ, まよ•う), which means “to get lost, be perplexed. Combine this with 路 (ロ, じ: path, road, route) and you get 迷路 (めいろ), the word for “maze.” He is intrigued by the study of kanji because understanding each character requires navigating a maze of multiple meanings and dynamic relationships with other characters.